Ragley Hall Battle Proms raises over £8,821 for Combat Stress! Thousands of happy picnickers once again invaded the stunning grounds of Ragley Hall for the 6th annual Battle Proms open air picnic concert on Saturday night, enjoying a choreographed Spitfire display and full orchestral performance by the New English Concert Orchestra and conducted by Douglas Coombes. The full programme of sublime classical music also included the Battle Proms signature piece - Beethoven's Battle Symphony - performed as he intended with the full complement of 193 live firing cannon providing a thunderous percussion! This year the ever popular cavalry display by Crown & Empire was performed in WW1 regalia and there was a moving performance of The Battle of the Somme by William Laurie, who fought at the Somme and later died of his injuries, as the Battle Proms marked the centenary of this important historical event. Each year the concert raises funds for Combat Stress, the UK's leading mental health charity for veterans. Combat Stress provides free specialist clinical treatment and practical support to ex-servicemen and women across the UK with mental health conditions including Post Traumatic Stress Disorder, depression and anxiety. 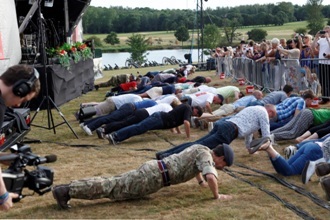 This year a fabulous £8,821.33 was raised from audience donations at the Ragley Hall concert, and many of the audience, and even some of the stars from the stage, participated in the #22PushUpChallenge, doing 22 push ups to help raise awareness of veteran's mental health issues and the vital work that Combat Stress undertake to help those living with PTSD. Faye Walters, Volunteer and Community Fundraising Officer at Combat Stress, said: "I'd like to say a huge thank you to everyone who donated to us. We're thrilled with how much has been raised. The Battle Proms season is a great opportunity for Combat Stress to raise much needed funds and awareness, and every year the Battle Prommers never disappoint with their support. Since 2004 the amazing amount raised by the concerts has helped us to reach thousands of veterans across the UK and support them in rebuilding their lives. With the donations received at the weekend we can continue doing that"
The Battle Proms will return to Ragley Hall on Saturday 12 August 2017. To find out more information visit http://www.battleproms.com or http://www.combatstress.org.uk , and enjoy the entries to the Battle Proms Photo Competition online at http://www.facebook.com/battleproms and http://www.twitter.com/battleproms.